Congratulations to the 2016 Big Red Raffle Winners! Congratulations to Kevin Daily! He is from the Hastings Alumni team and this year’s Big Red Raffle athlete drawing winner. He receives a Mini iPad. O’Neill takes honors for the top selling team. The O’Neill team sold 404 books and 314 individual tickets for a grand total of $9,650. The top selling team gets $1,000 cash deposited into their account. Great job O’Neill team! These four athletes sold the most Big Red Raffle tickets in their regions. For their hard work, they each receive a $50 Visa Gift Card. The Teams are the big winners! This was a big year for the raffle! All teams raised a total of $119,177.03. 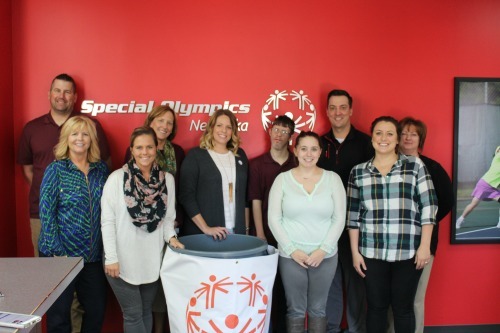 100% of the proceeds of the raffle is credited to each team who sells tickets, so all Special Olympic Nebraska teams who sold tickets are big winners! Special Olympics Nebraska athlete Bill Drackley of the Papillion team came to the state office to draw the winners. Thanks Bill!